'Guild continues its championing of Peter Fribbins's music with this collection of chamber works, all written in the last 20 years, and as before showcasing the vibrant, colorful but essentially tonal writing of this British-born composer. Although he continues a chartable line from Britten and Tippett, to my ears there are also continental influences such as Janáček and traces of the early 20th-century French school that give his high-minded, often literary influenced works an intriguing non-British flavor. The collection starts abruptly with The Zong Affair, the sharp, biting folk elements giving this single-movement septet a darkly sardonic air, in keeping with its grim subject matter, the mass killings on board a British slave ship in 1781. Cruel yet profound, its final lament strikes a note of darkness absent elsewhere in Fribbins's brightly colored works. The title work, Dances and Laments for violin and cello, is a more conventional five-movement suite, jagged and playful, although it only really gets into its stride in the final section, "Dance in Three." Beautifully played by Philippe Graffin (a high profile name here) and Henri Demarquette, it is a drily scored, edgy work that contrasts with the plusher items that follow, such as the piano and cello miniature ... that which echoes in eternity. An utter charmer, this is very Satie-esque in its minimalism and structure, but growing ever more rhapsodic with the cello sneaking in gradually over the submerged tread of the piano writing. A fascinating, conventionally beautiful piece, it is the finest and most accessible work here, although there's much to enjoy elsewhere, with the skittish Porphyria's Lover, whose opening dissonance quickly dissolves to quicksilver wit and energy. Exquisite too is the single movement piano trio Softly in the dusk, very French-tinged with its chromaticism and repeated motifs. After its dying droplets of sound, it is a shock to end with the organ, but Fribbin's Chorale Prelude and Fugue on Cromer charts a similarly contained journey, albeit tonally playful. Written especially for the organist Michael Frith, it is a contemplative if somber way to close the proceedings. "This work by Peter Fribbins, dating from 2011 and revised in 2013, is dedicated to Michael Frith who has recorded it, together with other music by the composer on Guild GMCD 7397. It is a largely contemplative study on the old hymn-tune, fluent and almost entirely without dramatic contrast, a work that draws the listener into its evolving labrynthine world, more fully explored in the fugue. Overall, the piece may be considered to be an exploration of the implications behind a large-scale perfect cadence, the Prelude ending in F major and the Fugue in C, but overall this is a composition which does not reveal its secrets immediately, being one that is surely worth close study - to the point where one hopes that Fribbins will consider the writing of a larger-scaled organ work in the near future. This Prelude and Fugue betokens a composer who thinks contrapuntally and naturally within the orbit of the organ-loft. It is very well presented by this excellent publishing house, and to those interested in exploring new and worthwhile music for the organ it is highly recommended"
Peter Fribbins' The Zong Affair will probably have most listeners scratching heads at the title before they've pressed the play button. Could this opus be based on a little-known Frederick Forsyth novel, or an early Len Deighton spy thriller? Er, no. The sleeve notes and a spot of googling reveal that this gravely eloquent piece is a septet inspired by Turner's 1840 painting The Slave Ship – itself a grisly depiction of the legal massacre of 142 slaves by the crew of a British slave ship in 1781. Fribbins' brooding, pungent music can seem too frenetic in places, though brilliantly scored. The most affecting sections are the brief moments of frozen stillness near the centre, and the downbeat coda, its irregular bass thumps suggesting a faltering heartbeat. Like many contemporary British composers, Fribbins has a day job as an academic. And the fact that you probably won't have heard of him is a matter for regret, as the music collected on this anthology is consistently engaging. The five movements of the violin and cello duet Dances & Laments seem to allude to the English pastoral tradition but have their own flavour. There's a beguiling, Dante-inspired piece for cello and piano, at its best in the slower outer sections. Fribbins' angular melodies are magnificent, and only their unpredictability prevents one from attempting to sing along. ‘Philippe Graffin’s... Kings Place concert with cellist Henri Demarquette... included the UK premiere of Peter Fribbins’s five movement ‘Dances & Laments’ for violin and cello... Fribbins may here occupy an useasy ground between bracing modernism and a more conservative idiom, but the expressive seed is palpable’. ‘Peter Fribbins’s ‘Softly in the Dusk...’ – an absorbing work extending the dreamlike scope of the D.H. Lawrence poem that inspired it, and dominated by a subtle, ever-present rhythmic tread... created a palpable sense of atmosphere’. ‘The evocative ‘Softly in the dusk . . .’ by Peter Fribbins was another nostalgic haunting work based on a D.H.Lawrence poem. Commissioned by the trio, this yearning work featured filigree treble piano, pleading strings and charming violin accompanied by a rocking cello, sensitively developed with joint intelligence. Short but sweet . . . a repeat performance would have been welcomed. "The title of Fribbins’s trio is taken from the opening of a short DH Lawrence poem entitled ‘Piano’, which reflects on memories of childhood and past times. Fribbins uses a falling third motif to reflect the yearning mood of the poem, winding through a meditative world where major sevenths hint at both pain and pleasure of separating with the past. As with Softly, in the Dusk, Fribbins’s music is full of rich colours and melodies, and this commission, along with other recent performances of his music, confirms him as one of the outstanding composers of his generation." "... Fribbins showed estimable attributes, namely a melodic impulse and a concise framework resulting in a plausible ten-minute span of uninterrupted music. Fribbins has made a habit of choosing literary themes for his chamber works and ‘Softly, in the dusk…’ is his response to a short poem by D.H. Lawrence entitled ‘Piano’." "... the work has its own integrity and impulse that should ensure its place in the piano trio repertoire." 'Since the appointment of Dr Peter Fribbins, composer, teacher and administrator, as the society's artistic director more than two years ago, there has been a wind of change and shift from the almost monolithic programming of the string quartet repertoire.But whether all its members and patrons have embraced the changes, it has never been, since its inception in 1887 in Whitechapel, a stick-in-the-mud organisation. George Bernard Shaw, in his guise as the critic Corno di Bassetto, wrote enthusiastically about the society's Sunday night concerts, which featured in late Victorian times the London premiere of Tchaikovsky's Souvenir de Florence and memorial concerts for Brahms and, in 1891, the centenary of Mozart's death.The LCMS, originally known as the Victorian People's Concerts Society, moved to South Place Chapel in Finsbury Park, and in 1929, under the name of South Place Concerts, to Conway Hall in Holborn, where with the support of the South Place Ethical Society, it still has its home.But whatever the members' and patrons' viewpoint about the LCMS today, it cannot be denied that the Fribbins factor has resulted in more dynamic and adventurous programming that, as he says, "aims to preserve the heritage of chamber music, encourage new work and develop an entirely new and youthful audience for the society's concerts." The twentieth century produced a Babel of conflicting and competing musical styles and idioms, many of which - those associated with different forms of what has come to be known as modernism - have proved resistant to attempts to bring them to large audiences: most works which use, for example, twelve-tone technique or other, more advanced, forms of serialism are normally calculated to guarantee half-empty concert halls, and as a result contemporary music as a whole has acquired a bad name amongst a section of the public whose natural conservatism has been thereby reinforced. For most of the late 20th century the very words “new music” evoked a bone-shakingly dissonant, intellectually opaque, well-nigh impenetrable experience that would be either unpleasant or turgid, and usually both. But that was then. Britain now has a new generation of serious composers with, I believe, a real determination to communicate a range of passions that would have been quite alien to the cerebral, system-obsessed composers of the previous generation. I am thinking of such people as Thomas Adès, James MacMillan, Judith Weir, Julian Anderson and the precociously young Luke Bedford*. It is interesting that all of these composers have been influenced to varying degrees and in different ways by the techniques of high modernism and incorporate into their work aspects of the liberated musical language which the techniques of “new music” have opened up; but they do so with a flexibility and concern for expression and communication that seem (at least to Morrison and many others) to be largely lacking in the music of their predecessors. The name of Peter Fribbins might well have been added to Morrison’s necessarily selective list. He is younger and not yet as well established as most of those composers, and he is no longer so obviously a youthful prodigy as Bedford. He was born in London in 1969, and studied first at the Royal Academy of Music. He became a composition pupil of Hans Werner Henze, later taking his MMus at Royal Holloway, University of London; more recently he has been awarded a DMus in composition at the University of Nottingham, as well as a Fellowship of Trinity College, London. Henze, of course, has been at times a high priest of modernism, but he has always had a concern for communication, largely, no doubt, as a result of his commitment to radical socialism; his technique has always been characterised by economy and a concern for the effectiveness of every note. This fastidiousness and clarity of expression, as well as a readiness to communicate, are also features of Fribbins’s music. It may not be without significance that Peter Fribbins’s role as Artistic Director of the London Chamber Music Society’s concerts has brought him into contact with a highly conservative, albeit well-informed, audience steeped in the music central to the European classical tradition; but it is this music, characterised above all by logic, economy and rigorous technique, which has so far shaped his outlook and development as a composer. Thus chamber music continues to feature prominently in Fribbins’s output. I reviewed his Clarinet Quintet (1999-2001) in the previous issue of this Journal, and an account of the London première of his Piano Trio (2004) will appears in the next issue. Both are finely wrought, technically accomplished works in which no note is wasted; the Trio seems to me the more structurally assured, if only because it is more conventionally proportioned. Both works make use of the rich harmonic possibilities of tonal allusions, overlaid with freely chromatic arabesque and filigree; at the same time complex rhythmic patterns and combinations create a disorientating temporal freedom. The interludes in the third movement of the Trio are cases in point: a sweet melody, vaguely reminiscent of an old-world waltz, is subjected to rhythmic and pitch distortions, not with ironic intent as so often with Schnittke, but with a hint of nostalgia – melancholy, even - recalling the similar effect of the second theme in the first movement of Elgar’s Piano Quintet, a work which Peter Fribbins holds in high regard. Is it possible that this composer, albeit unconsciously, feels himself to be at the end of a tradition, as both Brahms* and Elgar appear to have done? James Hepokoski writes of Elgar’s ‘valedictory world’, and of ‘trying to sustain an illusion forever slipping away from his grasp’* . Perhaps these works in their own way ‘ thematize the institution ’ of chamber music, as Hepokoski believes Elgar’s did for the symphony. The new Sonata is a large-scale, three movement work requiring formidable virtuosity from both performers. Again, there is much decorative writing and a strong melodic sweep, as at the opening of the initial Prelude where the piano weaves quintuplet scalar patterns in fourths while the cello delivers its surging main theme, both in their high registers. Throughout, cello and piano exchange lines and textures in entrancing dialogue, often decorated by scales in parallel intervals – a characteristic Fribbins fingerprint. The two remaining movements are entitled Aria and Toccata, traditional genres rethought and transformed, but giving clues to their respective characters (it may not be without significance that two movements in one of Fribbins’s earliest works, the Wind Quintet In Xanadu (1991), also bear these titles. The Aria, for instance, is not simply an extended melody for the cello; the piano takes its fair share of melodic interest, the cello providing an elaborate accompaniment; the dialogue is almost constant, each instrument adapting for itself the idioms of the other – perhaps another similarity with the Elgar Quintet, this time with the opening theme. The Toccata’s constantly-changing metres and rhythmic drive, together with some Eastern-sounding melodic patterns, suggest Bartòk as a background influence; but its character is essential Fribbins. At the heart of the movement there is a moment of calm in the form of a cadenza for solo cello marked Recitativo. This recalls a similar strategy in the slightly earlier ‘…that which echoes in eternity’ for violin and piano (2002-3), a single movement which has a long cadenza at its centre. There, however, the cadenza seems to me to be disproportionate in length and weight, and injects an inappropriate concertante element, suggesting that the work should perhaps form one movement of a much larger structure – most obviously a concerto. The Sonata’s cadenza is shorter, and does not seem to unbalance the movement in any way. The first performance of this obviously significant contribution to the repertory is eagerly awaited. What of the future? The String Quartet No. 2, a major commission from the Chillingirian Quartet on which he is currently working, will be the first of Fribbins’s works to revisit a medium which he has already explored successfully, and it will obviously demand a fresh approach and a new creative effort. So far, he has had few opportunities to write for forces larger than the ensemble of his Concertino for Seven (2002-3) or the small chamber orchestra of Hidden in this Nothingness (2004). Both these works, and the hint of something larger in the violin work mentioned above, suggest that he is ready to extend into the realm of orchestral music. Thus the Sinfonia for orchestra on which he has been working for some years seems to be appearing, albeit slowly, at the right time in his development. 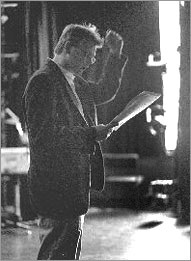 And for a composer who has frequently drawn inspiration from literary texts he has produced relatively little vocal music, though his Three Songs for soprano and piano (1999), to poems by Denise Levertov, demonstrate a keen response to the texts and a facility for word-setting that suggest that this is another genre in which he could produce something significant. Prophecies of the imminent greatness of young composers are notoriously hazardous. Even Schumann’s Neue Bahnen panegyric to the twenty-year-old Brahms, though ultimately fulfilled, backfired badly on the young composer and certainly inhibited his development* . So it is obviously futile to speculate whether or not any of Peter Fribbins’s works to date are ‘veiled symphonies’, or ‘lieder, whose poetry one could understand without knowing the words’. But it is vital that within his busy schedule of concert promotion and academic work he continues to find for himself a sufficiently tranquil mental space for creative renewal and exploration. *See Reinhold Brinkmann: Late Idyll:The Second Symphony of Johannes Brahms translated Peter Palmer (Cambridge, Mass: Harvard University Press, 1997, orig. 1990) for a full discussion of Brahms’s ‘melancholy’ as ‘a latecomer’s reaction’, in particular, p. 138. *James Hepokoski: “Elgar” in The Nineteenth-Century Symphony ed. D Kern Holloman (New York: Simon and Schuster Macmillan, 1997) p. 329. *Robert Schumann: Neue Zeitschrift für Musik 33 (1853), translated by Oliver Strunk, in Source Readings in Music History, revised edition, general editor: Leo Treitler. Vol. 6, The Nineteenth Century ed. Ruth Solie. (New York: WW Norton, 1998), p.115-6.